This may be the best lasagna I have ever made. The cashew ricotta was creamy and delicious. The sauce was perfect. It was a hit at the pot luck tonight. Make this for everyone you know. They will never know it is vegan! Soak the cashews the night before, at least 8 hours if not longer. Using the blender, process 1 cup of cashews to 3/4 cup water. Let it go for a while until thoroughly mixed. Do this until all cashews are processed. Place the cheese into a strainer with a very small mesh to drain the excess water. Refrigerate until ready to use. If using a Vitamix, this step may be unnecessary. Boil up the lasagna noodles in a well salted pot of water. Drop into an ice bath to stop the cooking when al dente, about 4 minutes. 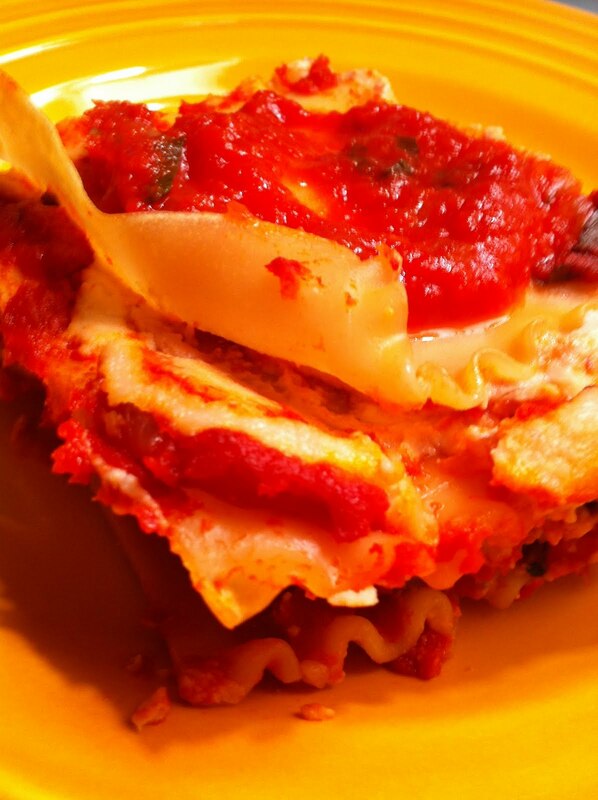 To assemble the lasagna, add sauce to the bottom of a deep baking dish. Layer the noodles, cheese, sauce, noodles, cheese, sauce, until you are done. Top the last layer of noodles with sauce and bake for about 20 minutes. Take out of the oven and let it sit for 10 minutes to settle. Serve and enjoy!